I’ve talked about fish traps in several previous posts. Recently I came across a set of maps showing the locations of traps around Southeast Alaska in 1918. This is a fascinating series, part of a government report from that year on the Southeast Alaska fishing industry. 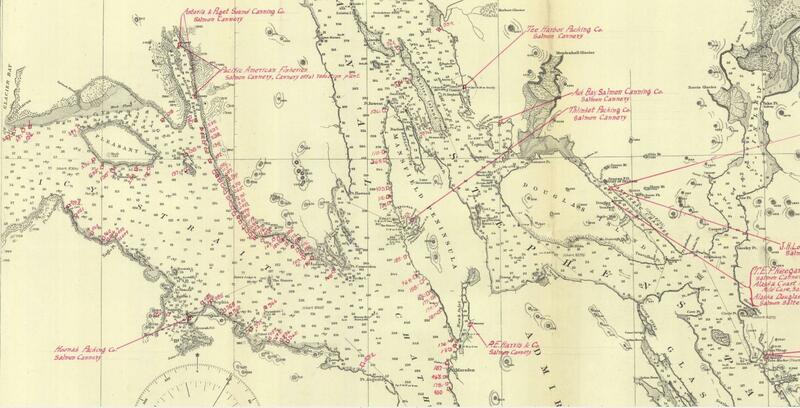 An excerpt from the Lynn Canal and Stevens Passage map is below, highlighting the region around Funter Bay (click to view a larger version). I will link to the originals at the end of this post. I have yet to find the original report which goes with these maps, so unfortunately there’s no key corresponding to the trap numbers. However, a quick glance at this map tells you a lot about where the salmon were to be found! The area of densely packed traps between Excursion Inlet and Point Couverden is known as Homeshore, and is still a popular fishing area today. Across all three maps in this set, covering most of Southeast Alaska, that one stretch of shoreline has the most fish traps per area. Note that most of the traps shown on the map are the “permanent” pile-driven type. A 1919 report stated that the Thlinket Packing Co at Funter Bay had 21 traps that year, only 4 of which were floating traps. Pile-driven pound nets seem to have fallen out of favor towards the middle of the century, probably due to the expense of maintaining them and repairing winter ice and storm damage. By the time fish traps were banned at Alaska statehood, floating traps predominated. 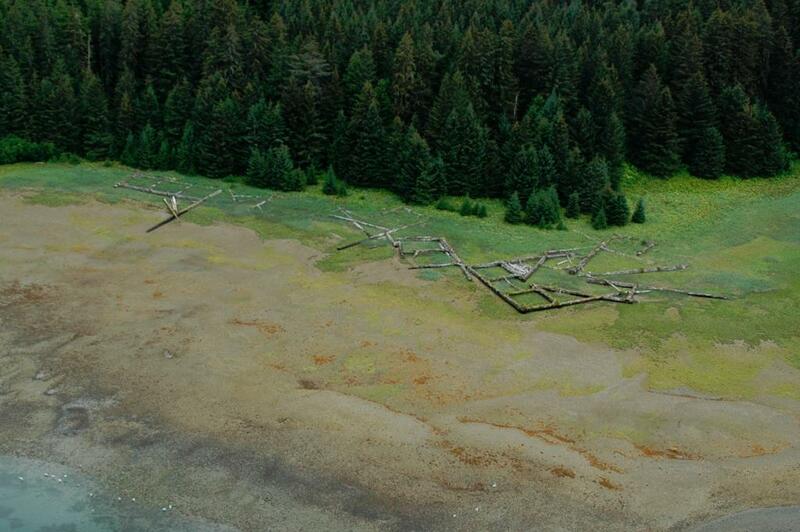 I have previously noted some traps on the beach at Funter Bay in old aerial photos, floating traps were often taken ashore or anchored in shallow water for winter storage. The traps at Funter have all been beaten into individual logs by decades of storms, but I recently noticed a few semi-intact traps in Excursion Inlet. These are visible on the Alaska Shorezone project’s imagery. This entry was posted on Saturday, August 10th, 2013 at 1:18 pm and is filed under Alaska History, Funter Bay History. You can follow any responses to this entry through the RSS 2.0 feed. You can leave a response, or trackback from your own site.